McDonnell-Douglas DC-9-41 SE-DAO (cn47509/643) is seen here with full reverse on runway 06 of Amsterdam IAP somewhere during the 1980s. While stormclouds gather over Amsterdam IAP, DC-9-41 SE-DAM (cn47499/568) sits at the gate waiting for its passengers. 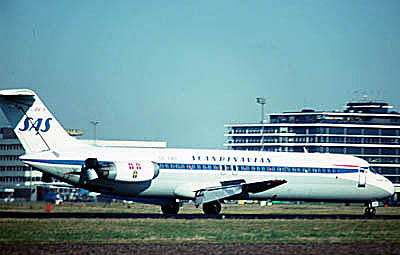 This colourscheme was carried through the 1980s and was introduced during the 1950s and carried on the DC-6s and DC-7s (as Ferry van der Geest kindly informed me). With slats fully extended, DC-9-87 SE-DIU (cn 53011/1931) is on final approach into Amsterdam IAP during Feb.2000. Somewhere during the 1990s this colourscheme was introduced, but I would welcome more exact dates. Peter from Hamburg,Germany wrote me in Jan.2006: "In the section for SAS Sandinavian Airlines you ask for more detailed info about the so called "eurowhite"-livery. This livery reflected the "new" SAS and the period from 1983 until the mid90's remaines the best time at SAS with a clear culture and streamlined fleet (based mainly on DC-9/MD-80/B767). I think that this livery was introduced in 1983 and lasted until 1998 and replaced by the one actually used (which raised many doubts since then because it is not very practical). Boeing 737-683 LN-RRZ (cn 28295/149) is gathering speed on runway 01L, undoubtedly for a destination north. The 737-600s were delivered in the new livery during 2001. Scandinavian Airlines System celebrated its 60th anniversary in Sep.2006 and also its first transatlantic service. The airline, today known as Scandinavian Airlines, part of the SAS Group, was born Sep.17th, 1946, when 28 specially invited guests flew on its new DC-4 "Dan Viking", with a stylized Viking Dragon prow on its fuselage, from Bromma Airport in Stockholm to New York. The journey took 25hr. with intermediate stops in Copenhagen, Prestwick and Gander. 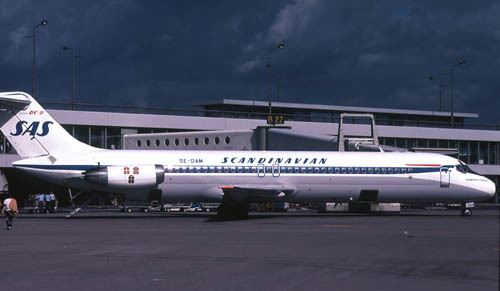 SAS was formed following an agreement that was signed on Aug.1, 1946, among the governments of Denmark, Norway and Sweden effectively to combine their national airlines. Interestingly, its origins actually date back much further. On Oct.29, 1918, Willie Wulf director of the East Asiatic Company, and ship owner H.N.Anderson founded Danish Airline DDL, Det Danske Luftfahrtselskab, one of three national predecessor carriers. 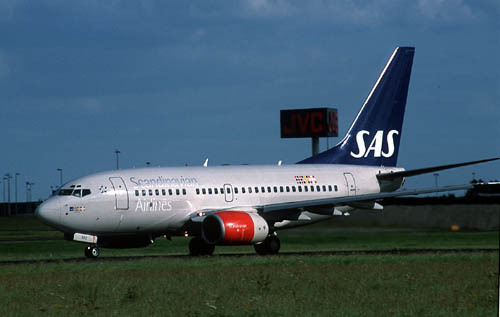 SAS also claims the distinction of being the "first European airline to begin service to New York after World War II." This was accomplished on June 27-28, 1945 (actually the war in the Pacific was still raging), by an SAS predecessor, SILA, that operated a converted B-17 that had been interned in Sweden with its crew during the war and subsequently was sold by Uncle Sam for usd 1.